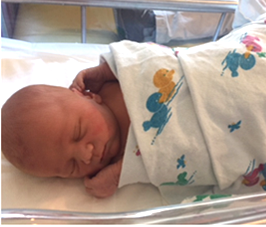 Scott and Emily Cornella recently announced the birth of a baby boy, Emmett. Scott was one of the chief residents during the 2015-16 academic year, and is currently a second-year fellow in the Division of Gastroenterology and Hepatology. Emmett was born on October 17th at 11:47 pm, and weighed 8 lbs. 1 oz. Congratulations to Scott and Emily!